Add sparkles to your look with on trend colourful crystal jewellery, clothing or accessories. Gorgeous, refined and breathtaking, yet functional, designers around the world are using these sparkling and colourful elements to add special touches to fashion items to create chic effects. Mrs. Oluseyi Abdullahi, Managing Director, Crafties Hobby Craft Limited, recently organised an annual products preview session for crystal users. In attendance were representatives of Swarovski from Austria, Mr. Michael Renzler, who made a presentation of their products, as well as members of Fashion Designers Association of Nigeria, FADAN, and Bead Jewelry Designers Association of Nigeria, BJDAN. On display were exquisite items such as crystal-encrusted Aso Oke by The Elect Aso Oke; a stunning crystal necklace by Subzy Elesho, delectable pendant and earring by Roxanne A; a striking black kaftan with an array of hot fix crystals and an indigo batik T-shirt, among many others. 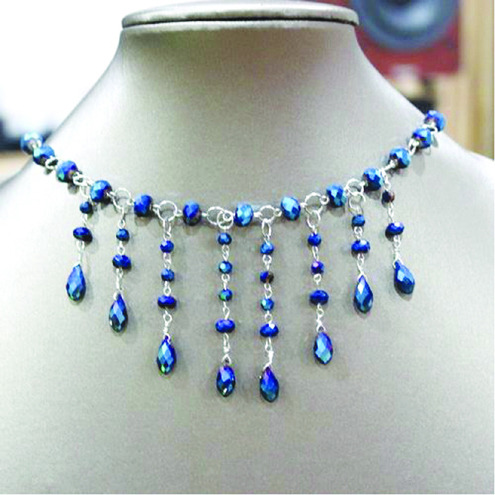 Mrs. Abdullahi, who for over 10 years now, popularised jewellery making via her company, said handbags, gloves, sandals, hats, trousers, T-shirts, bags are some of fashion items that could be decorated with crystals and stones, especially Swarovski crystals. Renzler said Swarovski elements are the premium brand for the finest crystals and are designers’ choice since the founding of the company in 1895. Creative Director of Nichole By Haguanna, Aisha Ugah Igbinovia, in her recently launched collection, Eternal Beauty, introduced a head turnng statement jewellery embellished with Swarovski crystals, corals, pearls and precious stones. The statement neckpieces features a multitude of colourful beads and crystals in different sizes and colours that can transform your loook in many fabulous ways, depending on the beading-materials used. Also in the collection are bags made with crocodile, alligator, buffalo, calf and snake skin leather finishes and superior sculptural metal hardware. When you wear jewellery over a long period of time, it tends to appear a bit dull. The chemicals in make-up, lotions, hair products, perfumes and even oil from your skin can settle on the surface of the jewellery, which will not make it look at its best or even damage it. To keep your jewellery sparkling, you have to take good care of it . Beaded jewellery is best cleaned with a soft dry cotton cloth, by gently bending the string over the fingers and carefully wiping between individual beads, or by gently and repeatedly running the string between the folds of cloth. It is a bad idea to wash them in hot or cold water or leave them in the sun.Also avoid commercial liquid cleaners, they cannot be rinsed off properly. Keep it in a place that is free of dust and it be well protected.